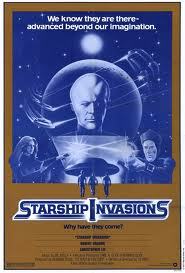 Starship Invasions was both in the perfect place to click in with the post Star Wars science fiction craze and in the worst possible condition to actually take advantage of the wave of films. It was in the perfect place to take advantage because it was released not long after Star Wars began to devour popular culture. There were very few science fiction films floating around that close to Star Wars release- the real wave that it inspired would begin until two years later when Alien, Star Trek, The Black Hole and others would hit screens. Anything that hit screens in 1977 and 1978 were either films that had been done already or were cash in jobs rushed together and thrown into theaters just to make a buck (any number of Italian scifi films anyone?) It was in the wrong place because the film was and is a weak throw back to films of old. It’s a film with okay special effects…or would have been had Lucas’s opus not opened and made people want better effects. The plot of the film has the evil Christopher Lee in a body stocking invading earth and taking on a galactic police force that presses a bored looking turtleneck wearing Robert Vaughn into the fight. Far from the worst film ever made as some have claimed, the film is best described as an amusing time killer. It’s the sort of thing you watch half out curiosity as to where it’s going and half disbelief at the notion that adults actually made this, I mean a body stocking for Christopher Lee? My relationship with the film is best described as sporadic. I originally learned about the film back in 77 when the film got coverage in various science fiction and genre movie magazines. There was some stills and talk about what the film was. I remember seeing the trailers and being interested but I never managed to see the film in it’s brief theatrical run. I think I saw the film when it ran on NBC and I thought it was okay. The film then kind of slipped into the void for the most part with the film being on tape that was in the video store I worked at in the late 80’s. After that the film was completely off the radar with only an odd mention or reference at various conventions when someone would see a poster and go “Hey I remember that”. It wasn’t until relatively recently that I managed to get a copy of the film and watch it. The reaction to watching it for the first time in decade was to kind of fall in like with the film. Sure the film isn’t good, but the film is such an incredible throw back to say the 1950’s that one can’t help but like it. I mean it’s as if someone tried to craft a 1950’s invasion film but did so in 1977- and they did it straight faced something that films like the Lost Skeleton of Cabrava doesn’t understand- for camp to work you have to fall into it.. The Starship Invasion makers fell into it. Is it a great film no, but there is a weird innocence to it that makes it charming. Even its modern setting, while kind of ill-advised now plays as charming and as almost charming. I like the film enough that I can put it on late at night and fall asleep to it.